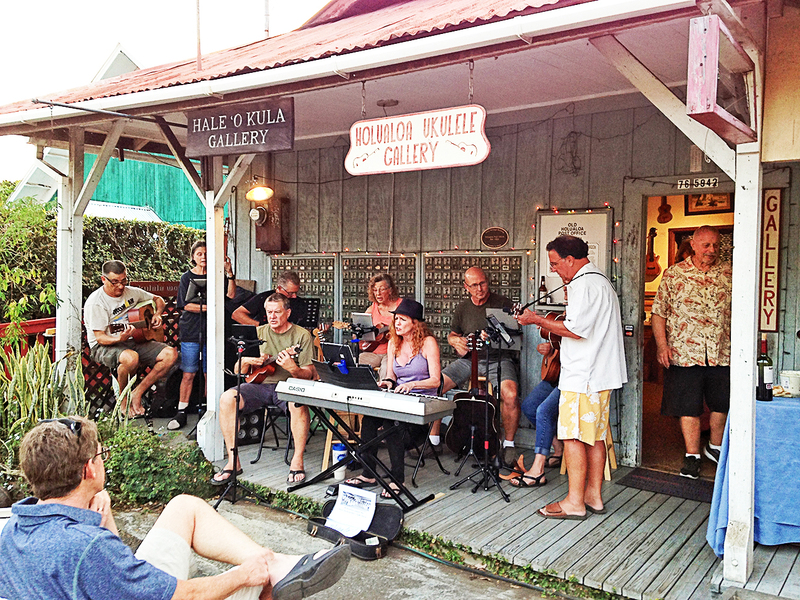 First Friday music in Holualoa. Courtesy photo. Holualoa Village celebrates Cinco de Mayo and Art-After-Dark this Friday, May 5, 2017 from 5:30 until 8:30 p.m. There will be music, food vendors and new art at the village galleries all along Mamalahoa Highway in the historic upcountry coffee town. Dr. Tim and the Medicine Band will perform on the Ipu Arts Plus lanai and Dave Lawrence will again be cranking up the crowd with classic rock n’ roll at Koa Realty. Emeralds, the birthstone for May, will be featured at the Kona Hotel gallery of Pat Pearlman designs. Emeralds carry the rich green color of spring and are considered to be a symbol of rebirth and love. Maestro Andrew Sweeney will sing and play piano outside the Holualoa Gallery while artist William Wingert works on a new painting inside. Kona Dogs and Holoholoz Fish will offer tasty street eats to the evening village strollers. Glyph Art Gallery will be in Cinco de Mayo mode all night, with south of the border pupus. Artist Faith Rockenstein will be showing her new work, and will be at the drawing board demonstrating the under appreciated beauty and depth of colored pencil as a medium. New work by Mary Carol, Lisa Bunge and Joan Blackshear will also be on display. The Holualoa Ukulele Gallery will offer Cinco de Mayo refreshments and debut new instruments and new vintage sheet music, while the Mauka High Notes entertain on the front lanai of the old Holualoa post office building from 5:30 until 8:30 p.m.